After months of anticipation, the Little Printer is finally ready to face the world. A teeny-tiny thermal printer complete with a teeny-tiny happy face, the efficient, cloud-connected device prints out customizable mini newspapers of web content and social media updates, PC Mag notes. 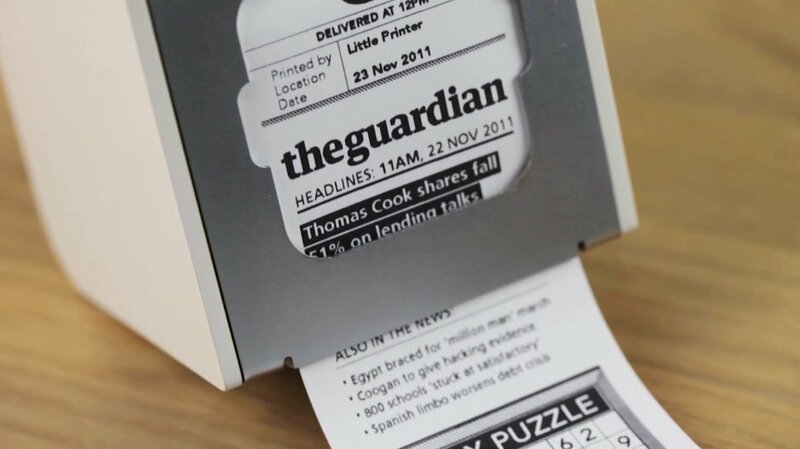 So from news headlines from the BBC to friends' birthdays from Facebook, a Google Tasks to-do list and your favorite daily crossword puzzle, the Little Printer can be personalized to deliver your favorite morsels from the Internet in miniature hardcopy form. 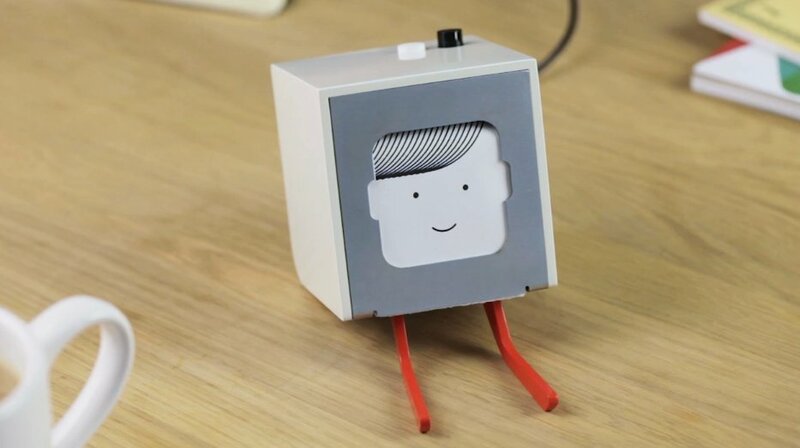 The brainchild of the British design consultancy firm Berg, the Little Printer also has a rather adorable little face -- one that it automatically reprints every time new information is delivered, as it attempts to engage the user with evocations of nostalgia and the whimsy of childhood cartoons. "We are at the crossroads of media, technology, and experience, playing with what each medium allows in letting you tell stories in new ways. The next place to be transformed is the front room or table top," Matt Webb, a co-founder of Berg, told the Verge. Connected wirelessly to the Berg Cloud Bridge (which, in turn, plugs into a router and manages online subscriptions from Berg's content partners like foursquare and the Guardian, as well as whatever other web information you choose to feed into it through the Berg Cloud Remote smartphone app), the printer uses cheap, inkless receipt paper and, according to its makers, is meant to sit unobtrusively in one's home. "There’s a slightly nightmarish vision of a world full of glistening, super high-res Retina Displays all over your house, a sort of Total Recall world where everything’s a TV," Berg co-founder Jack Schulze told Co.Design. "These objects have to live in your home, connected, but they can’t all be ringing and pinging, winking and flashing all the time. They have to be kind of calm." Though quiet on your kitchen table, the Little Printer -- which was made available for preorder Tuesday on Berg's website -- has been causing quite a stir this week in the tech world. Widely praised for its cute yet simple design, some industry pundits have said that the pint-sized printer has the potential of provoking a gentle paradigm shift in the way we interact with technology and social media. "It’s a hack of old technologies, aimed at creating a calmer vision of social networking. It’s a limited device that’s meant to fit into our day rather than demand attention," Co.Design notes. "Berg is exploring whether there's space in our lives for media that refuse to be swiped or pinched and zoomed," said the Verge. Despite the positive feedback, however, most acknowledge that this is almost certainly a device you don't need. "Besides looking pretentious on the subway with your little designed slip of Internet tidbits, why not just read those things on your phone? Also, that 10-inch piece of paper doesn't give much information," notes Yahoo! News. Others have also pointed out that using the printer may be environmentally irresponsible. "The Little Printer is by definition a producer of waste. While most people have moved on to a mostly post-paper world, the Little Printer aims to drag them backwards into the pre-digital age," wrote one VentureBeat writer. And with it's $259 price tag, it's certainly not going to be a go-to purchase for people looking for a novelty gift item. For their part, Berg acknowledges that printing these personalized 'digital post-its' at home is likely not going to stick in the long run. "For the moment there's something so interesting about a mini newspaper, so we are going down that path," Webb told the Verge. But eventually, he said, there's a greater future planned for the Berg Cloud -- which he claims was designed to be "flexible and capable of powering anything from connected watches to smart infrastructure for a new city block."